Nice gentle walk on the Pipeline Track today. One publishable fungi shot. Don't think I've ever seen one of those. Very Nice! 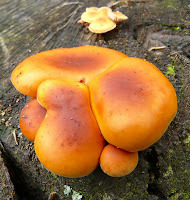 I just posted a bunch of fungi on my blog yesterday. Nice Fungi shot. I wonder what it will turn out to be? Probably different from the little cream-coloured gilled fungi in the background. This looks like a big, leathery thing. I have seen some similar things, but never got an ID on them, unfortunately. For some unknown reason, it just reminds me of some orange-flavor buns. Man, really want to sink my teeth into it. I will try to go back and track both of them as they change. I'll get a good photo of the ones in the background too. The Large yellow/orange ones might turn out to be Gymnopilus junoniensis. Grow in clumps, from old wood. If you have Bruce Fuhrer's Field guide to Australian Fungi, try P74. Tassie is famously rich in Fungi, apparently. Yes I have Fuhrer's guide. Gymnopilus junonius is possible I suppose Denis. When you google it, I reckon there are a good 5 or 6 different species identified as G. junonius. A couple of photos have some similarity.